Have you ever thought to change WordPress login page URL to add one more security layer? Though it can’t really stop the hackers still there is a chance. In this tutorial, you will learn the easiest way to accomplish this task. What Should You Do To Add A Custom Login URL? You should know the default login page URL is http://www.yourdomain.com/wp-login.php. You have to modify it by changing the permalink. WordPress is a platform with the thousands of plugins to help its users. You have to install and activate Custom Login URL plugin. I hope you know how to install a WordPress plugin. Just go to Plugins>>Add New and search for the plugin. After activation, navigate to Settings>>Permalinks and scroll down. You will see a section for “Authentication Permalinks”. Under that, you will see all the possible login and logout URLs which can be edited. At first, you will see all the default URLs. You should know that the URL for WP-Admin also gets redirected to the WP-Login page. Now, choose your custom login URL. Fill all the section shown. I have added just the customURL which is pretty common. You have to come up with something unique which can’t be guessed by anyone. Only you should know about it. The same can be done for the “register URL”. When you log out from WordPress, it gets redirected to the login page. When you log out from WordPress, it gets redirected to the login page. You should change it. Under “Authentication Redirect”, you should change both of the URLs. You can redirect your logout URL to the custom Login URL. It will happen only for you. But if you have a membership website then the login page URL will be shared. After all the changes, save them and you’re good to go. 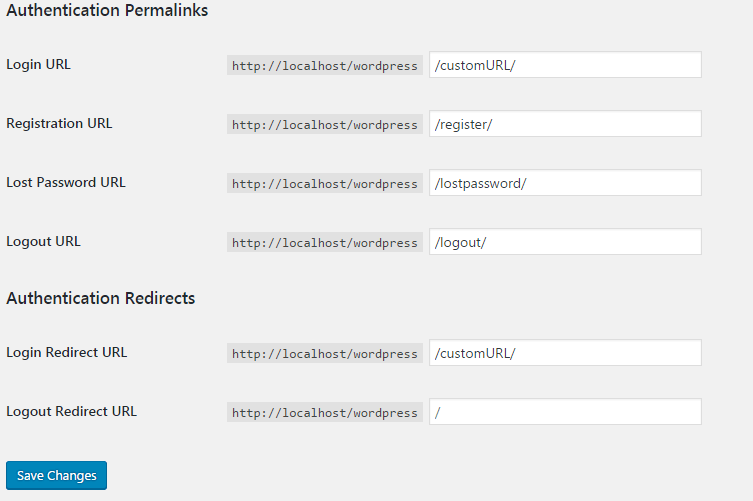 Now you can try to login with the custom URL you have just added to your WordPress website. If you can log in, it means you have successfully added a custom login URL for your website. There are some other plugins too but not all provide the features like this one. I Hope Now You Can Change WordPress Login Page URL. The above-mentioned plugin can solve the problem. Though it’s always recommended to avoid plugin but adding a custom login URL with the codes is complicated and beginners can get break their websites. To improve the security, you should disable PHP execution, disable password change option, disable directory browsing, limit login attempts, change the default admin name and more. Can you now change WordPress login page URL? If you still have any doubt, feel free to drop a comment. How To Increase phpMyAdmin Import File Size Limit In Xampp? Hello @Ravi. Clear Post you just shared on WordPress security. Even if it can’t really stop these hackers, atleast it could cause some headache for them. Hiding your WordPress Admin URL is an essential move to avoid hacking attacks such as brute-forcing. I’ll suggest, to make your WP site more secure, one must use Google Authenticator Plugin to login into the WordPress dashboard. Hiding your login URL can help you save from the normal brute force attack. People try to hit and trial method to log in. It’s always a good idea to use such plugins.